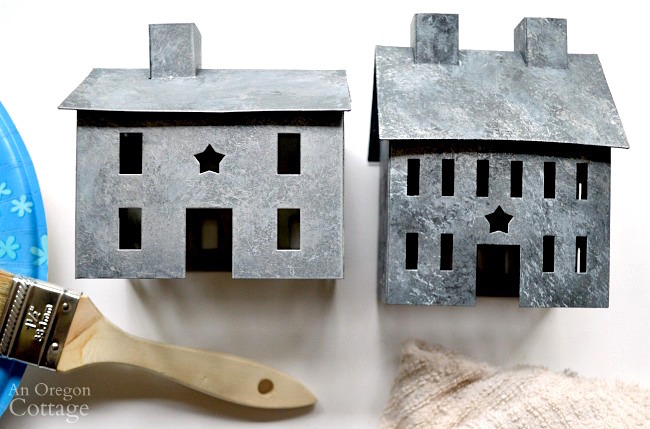 Easily create a faux galvanized finish with this 5 step tutorial on any metal surface like the small houses featured or anything else you find. I know what you may be thinking – a faux galvanized finish? Why would you need to paint something to look like galvanized metal – aren’t galvanized items pretty easy to find and inexpensive? Well, yes – there are a lot of galvanized metal items on the market now and they’ve always been a classic farm material for buckets and watering cans. And they fit most any budget. 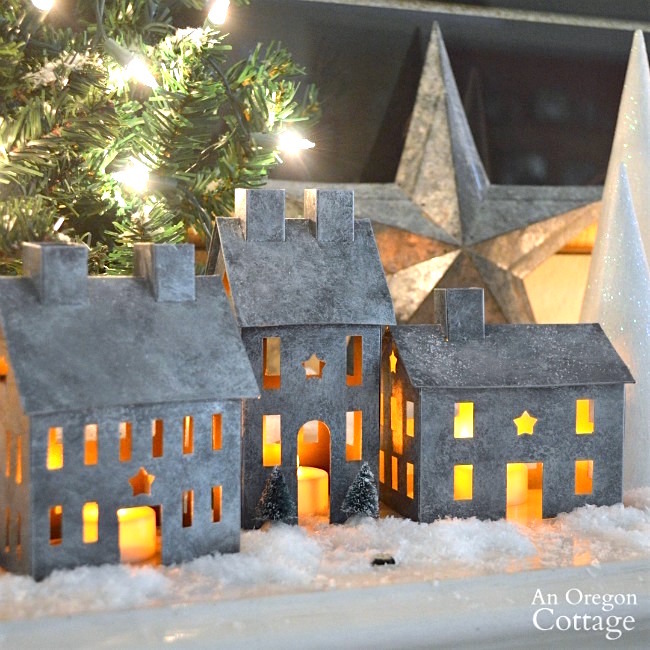 In fact, I bought a number of them to fill out the snowy galvanized Christmas scene I shared here that was inspired by a Pottery Barn catalog photo. Not in the market for village houses? This faux galvanized finish works for anything metal! Actually, I think it would work for paper mache items or similar, too, as long as the shape is something that could be made of metal. 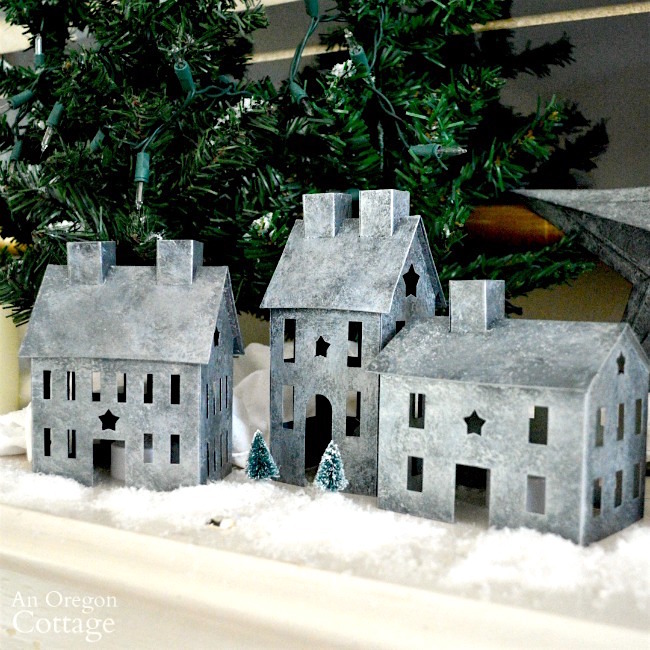 Simple farmhouse and cottage decor always has room for galvanized items and now you don’t have to be limited by only what you can find in actual galvanized metal. Plus, think of all the thrift store metal items you can give a new life with this: 80s and 90s mauve and floral pitchers and planters updated to a use-anywhere-neutral-galvanized-metal. 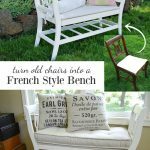 I love this – I may have to find some to redo and add to AOC’s list of thrift store transformations! 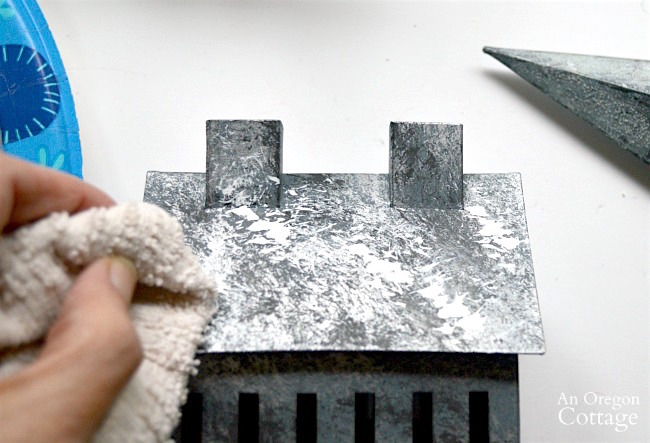 This galvanized paint technique tutorial will show you the exact steps you can take to create your own DIY galvanized metal finish. You do not need to know how to paint, how to paint faux finishes, or even think of yourself as ‘creative’ (though take that up with me at another time – I think we all are in one aspect of life or another!). 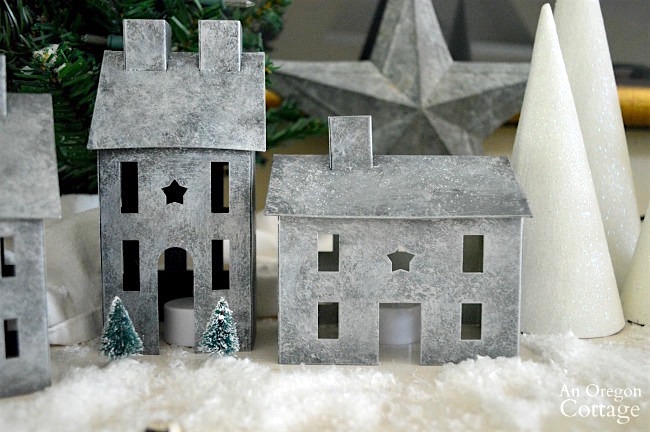 This tutorial is super easy, uses inexpensive and easy-to-find materials and takes just minutes, but results in a finish that no one will know isn’t galvanized metal. I promise. 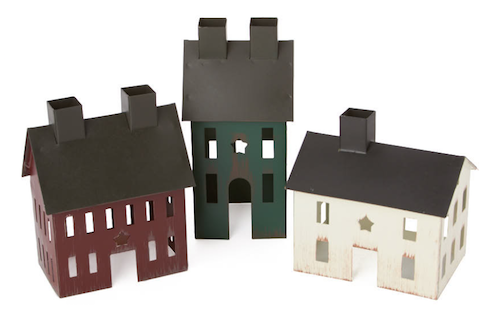 If you’d like to paint village houses like mine, follow this link to the set of three colonial houses from Factory Direct Craft. They’re about 4 inches wide and 4 to 6 inches high, which makes them perfect for a mantel, piano top, or foyer tabletop. Otherwise, shop your house, thrift store, or discount store for shapes you’d like to paint for yourself or gifts. Gather your supplies and find 30 minutes or so and you’ll have galvanized farmhouse decor that will seamlessly coordinate with any other galvanized items you have! Gray base. 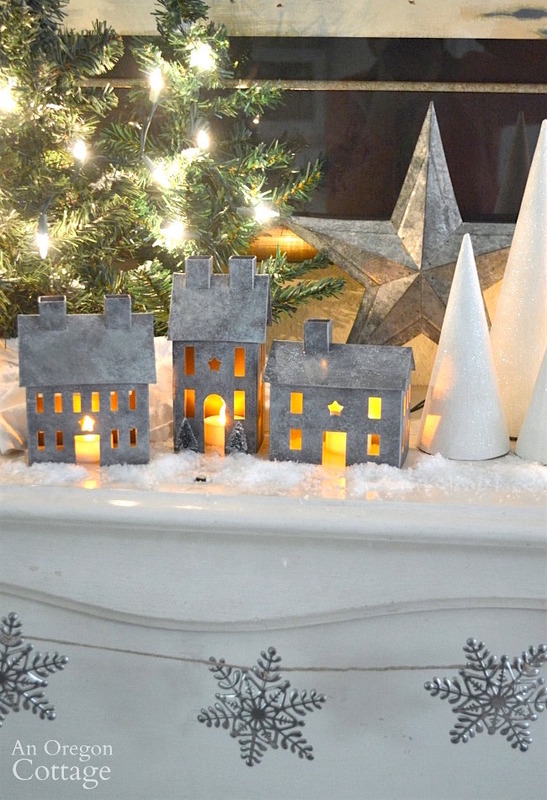 If your metal base isn’t gray, spray paint it with a light to medium gray. I used an actual gray spray paint, but I think a gray primer would work, too, which is easier to find. Metallic silver layer #1. Add a dollop of the silver paint to a paper plate, dip the ends of the chip brush lightly into the paint and then blot it on the plate. Move to the painted metal surface and start pouncing the brush up and down in various places all over. You’re not going for full coverage here, but some areas should be more covered than others like the photo above. Above is a comparison of what the metallic layer should look like compared to the gray base. Some areas are heavier and some lighter. We’re trying to recreate all the lowlights and highlights in galvanized metal. Black layer. 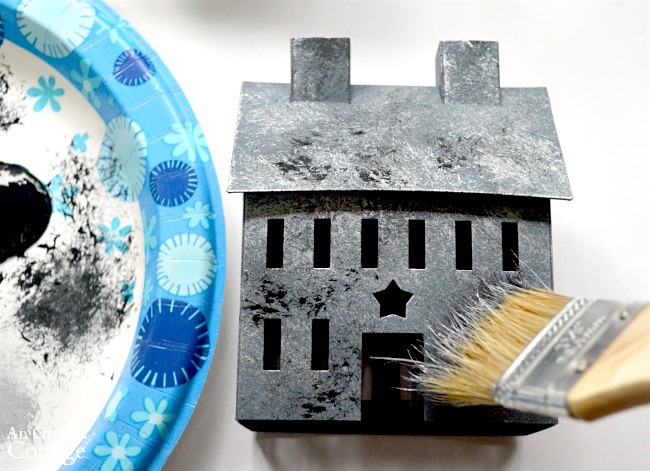 To add further lowlights, add black to the surface using the same method as the silver: adding a small amount to the paper plate, dipping just the ends of the brush and then blotting on the plate so the brush is just barely coated. Pounce here and there, but covering less than you did with the silver layer. TIP: You can use just one brush for this finish. Wash out the brush between paints and squeeze dry with a paper towel before using on the next color. It’s okay for the brush to be damp, since we are doing a blotting/dry brush technique here. White layer. Repeat the process with the white paint for the highlights, except: after pouncing a section, use a rag or paper towel to wipe and smear the white paint as it dries to create a mottled look. 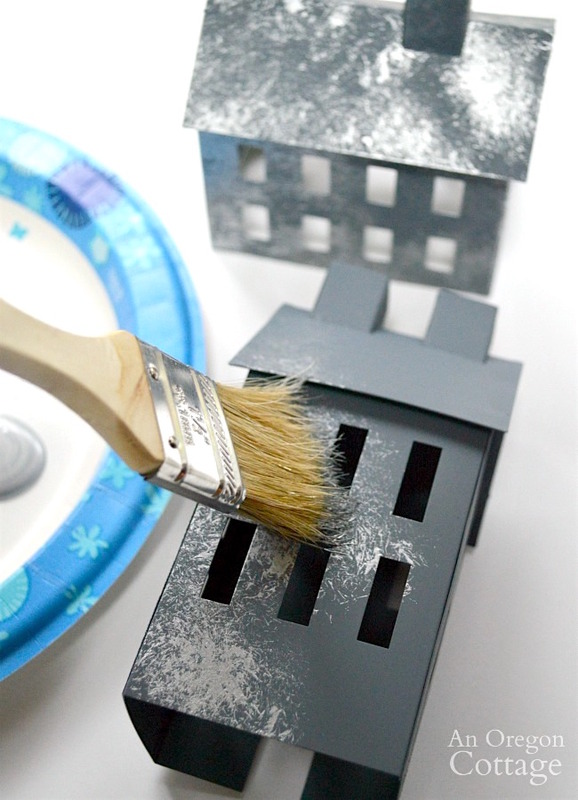 Push the paint into the crevices to replicate a weathered look. This is where it helps to have a piece of galvanized metal to hold it up to. 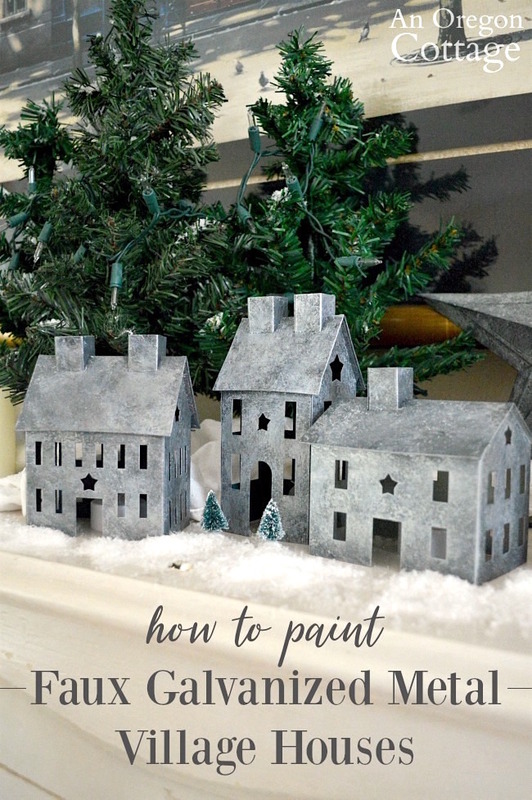 This weathered barn star had the look I wanted and would be included with the houses in the snowy Christmas scene, so comparing my paint job to it helped guide me to get the look I wanted. Metallic silver layer #2. Finish your fake galvanized piece with a last layer of silver. This time, really remove most of the silver paint from the brush by blotting on a paper towel. Lightly drag the brush over all the other layers, using the rag as needed to blend and give a smoother finish. 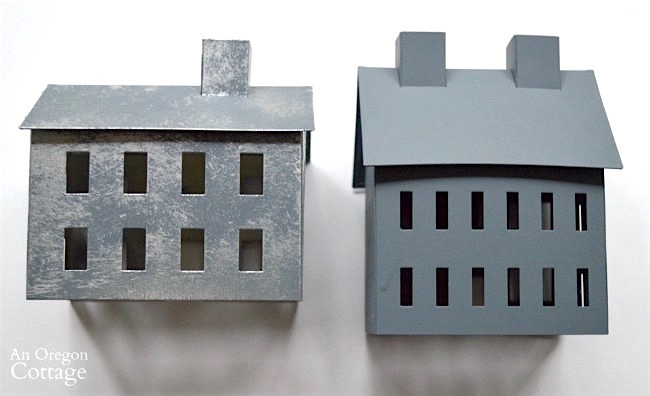 The photo above shows what you’re after – the silver layered house on the left has a smoother, more galvanized finish than the one on the right. You can see how all those layers work to create the different lights in the finish though, can’t you? As an option to protect your finish, you can spray all over the item with a clear coat finishing spray paint in a satin or eggshell finish. You want to avoid anything glossy, since that is not a feature of galvanized metal. Now, how about a good before and after? Pretty sweet, right? To be perfectly honest, I’m never really sure how these craft DIYs will turn out. 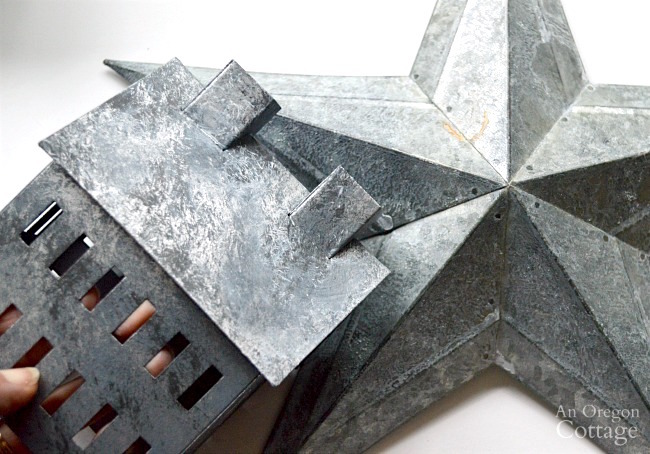 I’m just as surprised as you may be about how good they look – and how much they look like the weathered galvanized barn star I bought and compared them to. They go perfectly in the wintery scene! And now that I know it’s not hard to replicate a faux galvanized finish, I’m going to be seeing lots of things in new ways at thrift stores – and maybe even the decor I already have once it’s out of storage. Can you see yourself creating a finish like this on something? What would it be? I’d love to know! I adore those houses! Could have sworn they were the real deal. Hey, I live in Beaverton, outside of Portland. I love all the rain, cold and seasons here. We moved here a yr plus up from Albany, 3, up from cali. He got transferred. BEST DECISION EVER! There are REAL PEOPLE HERE! Plus the Farmers mkts and great food. I really like that star! Where did you find it? Did I miss the part of where? Merry Christmas! Found it! That lady asking about chip brushes…Michael’s, Ace, Home Depot or Lowes. They are super cheap! Thank you Jauquetta! And I’m so glad you are loving being an Oregonian. 🙂 Yep, I think Oregon is pretty real – and pretty laid back compared to CA and other big cities. I adore this. Plan on buyibg the little houses. I agree that they can be WAY over budget! I absolutely LOVE these! So much so that I just finished ordering my own set. Your instructions and pictures are really clear and full of good hints and tips so I’m looking forward to doing some faux galvanizing of my own just a ways north of you (Silverton). Did you feel our earthquake today? A 4.0 centered 3-4 miles from here just before 5:30 p.m. Rock and roll time! 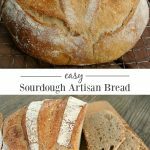 So glad you’re going to make some of your own, Beth! And no – we didn’t even know about the earthquake – guess we have to listen to the news more. Yikes. Glad it wasn’t stronger! Yours turned out no beautifully and, while I’m not sure what kinds of gray paint I’ll find here, I’m wondering if gray primer might be a bit light for this project? Our Ace Hardware is pretty well stocked, but I’m wanting the gray to contrast at least some with the white paint. Did you just go with a regular plain-old gray spray paint? Thanks! Also, I’ve done a ton of interior painting over the past couple of years but I’ve never seen a paint brush that looks like this one. Craft department, maybe? That’s funny Beth because I think of galvanized as being light, so I was looking for a lighter gray but all I could find was the medium-dark one you can see in the first photos. 🙂 Since it’s 4 layers under, it may not matter as much – go with what you think! That’s just a basic chip brush – I find them in the paint department. I don’t use them for interior painting much, though, since they tend to lose their bristles. I think craft departments carry them, too.